We've seen some pretty weird 3D-printed stuff, including Stephen Colbert's tentacle laden head, but a 3D-printed room with walls that look like they're melting takes the cake. 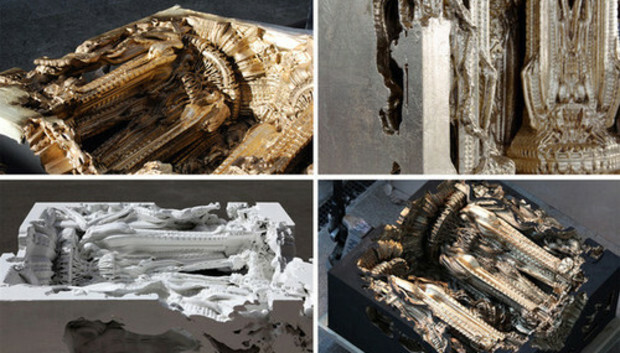 Designed by Benjamin Dillenburger and Michael Hansmeyer, the Digital Grotesque project is an amazing, gothic, yet organic architecture project that aims to create the world's first completely 3D-printed room. It might look like an amazing hand-fashioned sculpture, but computer-rendering algorithms were responsible for creating these H.R. Giger-esque forms. The program used a process that mimics cell division to repeat shapes into complex and bizarre patterns. A 3D printer fabricated the final model you see using sandstone. The artists also gilded their sculpture in golden paint.